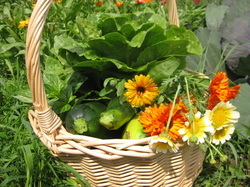 Community Supported Agriculture (CSA) is an alternative distribution model of fresh produce. It is a partnership between producer and consumer. In this exchange, the farmer produces and delivers fresh veggies each week to the consumer. In exchange, the consumer ensures a stable market for the farmer by committing to a full season. For the farmer, having a reliable and stable market is one of the keys to successfully managing a small-scale local farm. If you are looking for freshly grown vegetables; if the quality of the veggies found in supermarkets concerns you; if you don't trust the pesticides and chemical fertilizers found in conventionally grown vegetables, this partnership will surely interest you. La Belle Besogne Farm is currently looking for partners for the 2013 season. Please download the file below for more details as well as the registration form to this year's CSA program.